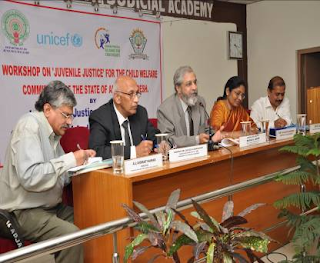 Tharuni: Workshop on Juvenile Justice to Child Welfare Committees of A.P. Workshop on Juvenile Justice to Child Welfare Committees of A.P. 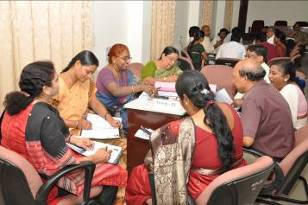 The Child Welfare Committees of Andhra Pradesh were invited to participate in the Workshop on Juvenile Justice on 28th January 2012 at A.P. Judicial Academy. The Hon'ble Chief Justice of High Court of Andhra Pradesh Sri Madan B. Lokur, Supreme Court Judge and senior Judges of A.P. High Court,Child Protection Specialist Sony Kutty George, All C.W.C. Chair Persons and 115 CWC Members,Director of J.J.Act and Correctional Services Board Sri Kismat Kumar, Police Officers attended the Workshop.A.P Alliance for Child Rights and A.P. Judicial Academy collaborated to conduct the Seminar. The Director of J.J Board stated that the Child Welfare Committee is the foundation of a Judicial pyramid having District Courts and the High Court working above it. CWC is the statutory body working independently with judicial powers to protect the children. Justice Lokur was amazed with the commitment and dedication shown by CWCs in the State to safeguard the rights of the children. He felt they lack sufficient human resources, stationary and infra structure and administrative costs and travel expenses which will be dealt by the Department soon..He advised the District Legal Services Authority to guide the CWC on legal lacunae, and provide legal aid to Children. He also stressed to establish Advisory Committees under Sec.62 of J.J.Act.The workshop was very fruitful to discuss and understand the specific issues ,challenges and bottlenecks in the functioning of CWCs to protect the children.